Rather busy at the moment , hopefully March will allow time for Oxford. A quick bump for the walk+sgwrs planned for next weekend (Sat 9 or Sun 10 March). These walks are often a mix of Welsh & English, and newcomers, partners & plantos, 1st language Welsh & monoglot English speakers all welcome! A quick bump for the walk+ sgwrs planned for next weekend (Sat 9 or Sun 10 March ). OK - this month’s walk will be on this Sunday, 10th March, to Wytham Wood and back starting out from The Trout Inn in Wolvercote. @RichardBuck you said you can make it on Sunday - does that work for you and plantos? These walks are often a mix of Welsh & English, and newcomers, partners & plantos , 1st language Welsh & monoglot English speakers all welcome! Well, let’s fix on 12:30pm to meet up outside ( ) Wolvercote’s Trout Inn for tomorrow’s (Sunday 10th) walk to Wytham Wood. (if you’re coming by car, there should be spaces in the Port Meadow car park about a quarter of a mile before reaching The Trout) . We’re going to be away till sometime on Sunday 14th, I think – going to Caernarfon this Sunday, then up to near Newcastle for a couple of days. I could do the following weekend. Helo pawb - Let us know if you think Sat 20th or Sun 21st April might work for you? 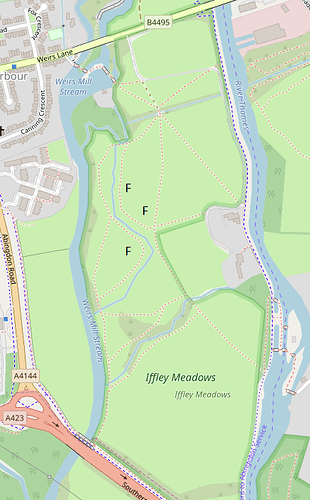 I don’t know where you plan to go, but the fritillaries in Iffley Meadows are better than ever this year. They are just coming up to full bloom, so they should still be good next weekend. That’s a great suggestion, Sue - why didn’t I think of that! Is Saturday a good day for you @ramblingjohn @RichardBuck @rachaelseculer-faber ? The most concentrated patches were at the places marked with F, but there were plenty of odd flowers elsewhere too. There were two fine patches of cowslips next to Weirs lane. Grêt! Diolch yn fawr, Sue!